"We love TV—from the shows to live sports to the can’t miss events. 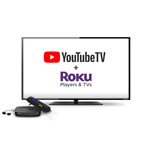 We built YouTube TV to give consumers a better way to experience this great content"
LOS GATOS, Calif.--(BUSINESS WIRE)--Roku Inc. (Nasdaq: ROKU) and YouTube today announced the availability of YouTube TV on select Roku® devices1. YouTube TV allows Roku users to stream live sports, local and national news, and must-see shows the moment they air on live TV. For $35/month following a free trial, users will get access to live TV from nearly 50 networks including ABC, CBS, FOX, NBC, CW, Disney Channel, ESPN, FX, Telemundo and more. Sports and premium networks like SHOWTIME, Shudder, Sundance Now and Fox Soccer Plus are also available for an additional monthly charge. Currently, YouTube TV is available in over 80 metro areas. YouTube TV is available in the Roku Channel Store now. To add the channel, click here.